Outreach is an essential component of my research program. I view myself as a liaison who has a unique opportunity to ask and answer questions that inform conservation decisions. Not only do I view my research and teaching activities as a direct response to the needs of decision makers, I view my scholarship as directly extending the knowledge base. My outreach interests focus on improving wildlife-related risk communication, integrating human and biological dimensions of wildlife, and program evaluation. Progress toward achieving bovine tuberculosis (BTB) management objectives (e.g., eradication) in Michigan has slowed in recent years. Communicating with deer hunters, specifically those interested in antlerless deer hunting, about BTB risks and desirable behaviors that reduce risks from BTB may help achieve objectives. To effectively communicate with resident antlerless deer hunters, managers and policy-makers need information on how hunters engage with information related to the disease and policies. And, how once information is received and interpreted, it influences risk-related attitudes and behaviors. Information to inform risk communication about BTB is currently weak, based on its absence in the scientific literature and the lack of progress toward achieving BTB eradication. In this research, we will develop, implement, and test the effectiveness of a pilot risk communication campaign targeted at a random sample of resident deer hunters who purchased antlerless deer licenses within the last five years (2007 – 2011) for the areas encompassed in DMU 487. The risk communication included a direct mail campaign with the following materials: 1) an informational brochure/fact sheet, 2) a lens cloth, 3) a magnet, 4) an online infographic. An online executive summary and visual representation of findings can be found here. Whereas in the past wolf management in Michigan was restricted to recovery, today, managers must contend with range expansion and post-recovery issues including policy changes (e.g., federal delisting, regulated hunting seasons); public responses to policy change (e.g., lawsuits, public votes, media coverage, poaching); and balancing preferences, tolerance, and behaviors of traditional and non-traditional wildlife stakeholders both within and outside Michigan. We explored the extent to which residents: (1) value wolves, (2) are interested in hunting wolves, (3) believe a decision to hunt wolves should be made by public vote and (4) are committed to sound science as a necessary component of wolf management decisions about hunting. Results suggest there is currently agreement among groups throughout Michigan regarding attitudes toward wolf hunting. This report was coauthored by Michelle Lute, Dr. Michael Nelson, and Dr. John Vucetich. [PDF]. Listen to a Michigan Public Radio’s Environment Report story on this project here. State management agencies tackle many challenging natural resource issues that often have more to do with public attitude and opinion than science. Outcomes of the public participation process (positive or negative) can have substantial impacts on policy decisions. Therefore, public participation is a critical aspect of the natural resource management decision-making process. Evaluation is a critical aspect of any stakeholder engagement of public participation process. There are many potential benefits associated with public engagement, but these benefits may not be realized in the absence of a thoughtful evaluation process. This project, conducted with theMichigan Department of Natural Resources and Environment and FW Outreach Specialist Jordan Burroughs, evaluates three dimensions of stakeholder engagement – relationships, information transfer, and fairness. In February 2008, Conservation Criminology faculty traveled to South Africa to network with scholars at the Environmental Evaluation Unit and Centre for Criminology at the University of Cape Town. CC faculty also traveled to the International Law Enforcement Academy in Botswana to explore opportunities to link online learning and research. 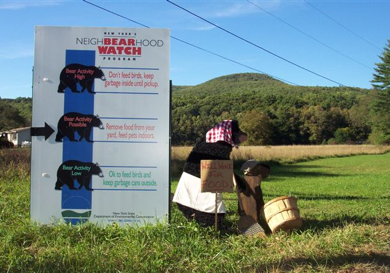 This pilot communication program, developed in partnership between the Cornell University Human Dimensions Research Unit, the New York State Department of Environmental Conservation, and theNortheast Wildlife Damage Management Cooperative, was originally developed to reduce negative human-black bear interactions in southeastern New York. This effort summarizes key elements of what bear baiting and hunting with hounds entails with relevance to Maine in an online report. The report reviews the status of the practices in various portions of the United States, provides a situation analysis within states recently confronting similar referendums, but does not offer arguments supporting or rejecting the merit of either side of the debate. This outreach effort was conducted in partnership with the Maine Environmental Policy Institute. This project entails development of outreach tools for black bear managers tasked with responsibilities for stakeholder involvement or stakeholder education in the Northeast and beyond. Part of this outreach effort involves a computer simulation with a user-friendly interface that allows persons with minimal computer training to simulate application of different bear management policies. The other key element of this research effort involves a document titled “Involving Stakeholders in Black Bear Management: Guidelines and Tools for Issue Education.” The document provides guidance about issue education and will instruct managers on the use of systems thinking generally and use of the bear management simulator specifically.